← “Do you think you’ll write any other book in the future?” And other questions, answered. “How would you feel about going and exploring Portland tomorrow?” my friend Sarah Beth asked me. A month or so ago, in my finding beauty post, I wrote that “This summer, I’d like to visit various pretty/awesome spots in Oregon and blog about them.” Portland seemed like a logical place to begin. Our friend Ashlie went along too. We didn’t make any plans, just hopped in the car and went. 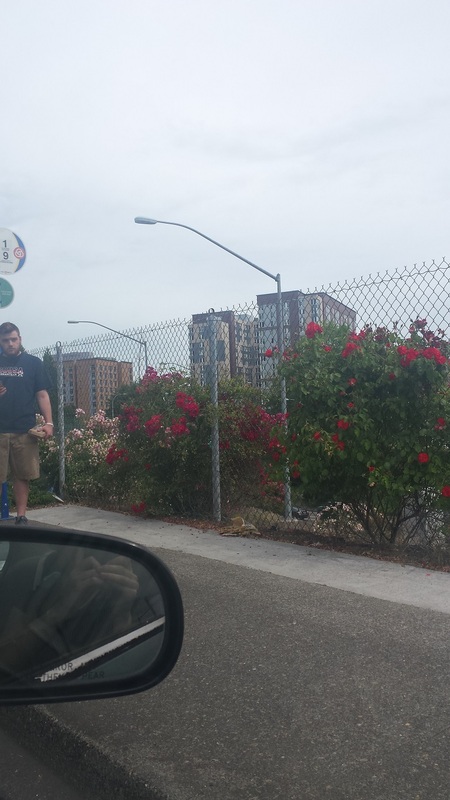 I took Sarah Beth’s phone and snapped a picture, out the window, of the pretty rosebushes that sprawled along the roadside. Only I accidentally took a creeper picture and the guy looked at me really strangely. 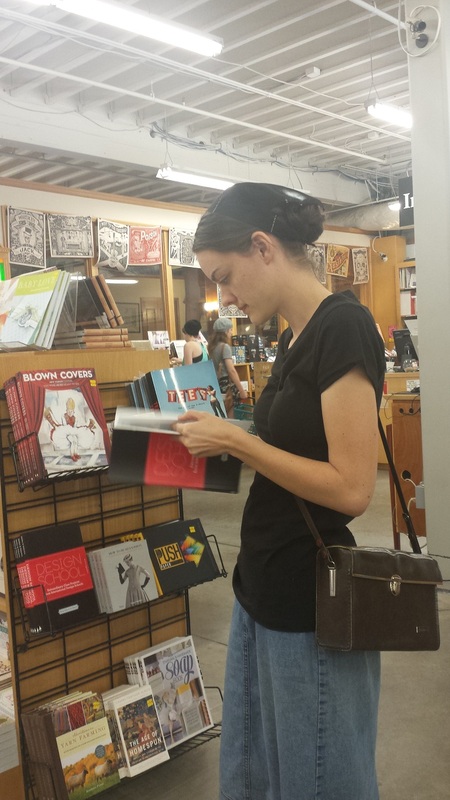 Of course, the first place we stopped was Powell’s Books. To be honest, it was kind of a disappointment. I was expecting it to be sort of like Smith Family Bookstore in Eugene, which also sells new and used books. Smith Family bookstore is the kind of place that is overflowing with books, stacking them in corners when there isn’t enough room on the shelves. There’s a library-type hush over the whole place, and you can wander in and out of the bookshelves for hours without seeing anyone else, occasionally hearing the click of a book being placed on the shelf in the next room to remind you that you’re not alone in this world of ideas. I expected Powell’s to be like this, only on a giant scale, with infinitely more places to get lost. It does, after all, call itself the “city of books.” But it wasn’t like that at all. Even though it was a Wednesday afternoon there were people everywhere. Everything was so carefully organized that it resembled a new bookstore much more than a used bookstore. I’d still recommend going, because it’s a great place to look for your favorite hard-to-find books. It’s expensive compared to thrift-store books, but cheaper than buying books online because you don’t have to pay shipping. Also, I kept laughing because around every corner I saw these people who looked so stereotypically portland-ish. Here I am reading a book about design school projects. I was trying to figure out if I was skilled enough to do design-school level sewing projects, but eventually I figured out that this wasn’t a book about fashion design school. It was a book about design school in general. Like, logos and stuff. We were in Powell’s for exactly an hour, and then our parking meter ran out so we power-walked back to our car and went to Taco Bell for lunch. Now I know what you’re thinking. You drove all the way to Portland to eat at Taco Bell?!? But the way I figured it, eating at an awesome Portland restaurant could get pretty expensive, and it would be much more economically feasible to eat cheap and fulfill our foodie obligations later by stopping at, like, an awesome Portland bakery or something. We then drove into a residential section with free 3-hour street-side parking, where we blocked the bike lane for about five minutes while we tried to parallel park. 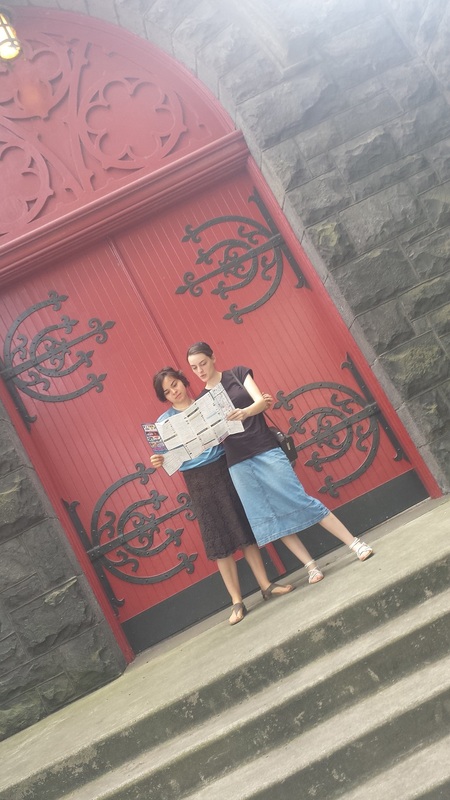 There was a really cool old church on the corner, and after trying unsuccessfully to go inside and tour it, we stood on the steps and read our map for a while, trying to figure out where to go next. Eventually we just decided to wander around and see if we could find any cool shops. It looked pretty promising at first. We ducked into this nifty store that sold cactus plants and wool ponchos and notebooks made with recycled paper. 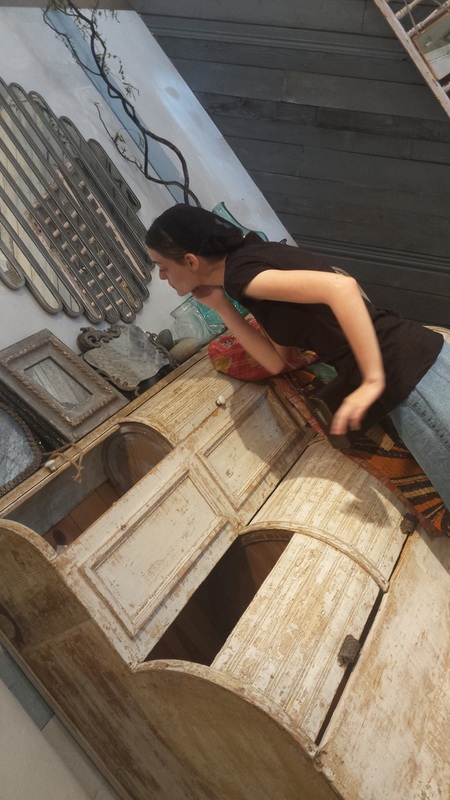 “I’m going to go look in that old mirror and primp, and you should take a picture,” I said to Sarah Beth. But when I got to the mirror I wasn’t sure I knew how to “primp,” so I pinched my cheeks like they do in old books and it ended up looking pretty odd. I was inexplicably tired. Since there was a Starbucks on every street corner, we went into one and Ashlie ordered some coffee and got me a cup of hot water. I had a tea bag in my purse, of course. The tea revived me a bit, but I was pretty embarrassed to walk around with a Starbucks cup. “Why is that embarrassing?” Ashlie asked, confused. “I don’t know. It just seems so, like, basic white girl,” I said. 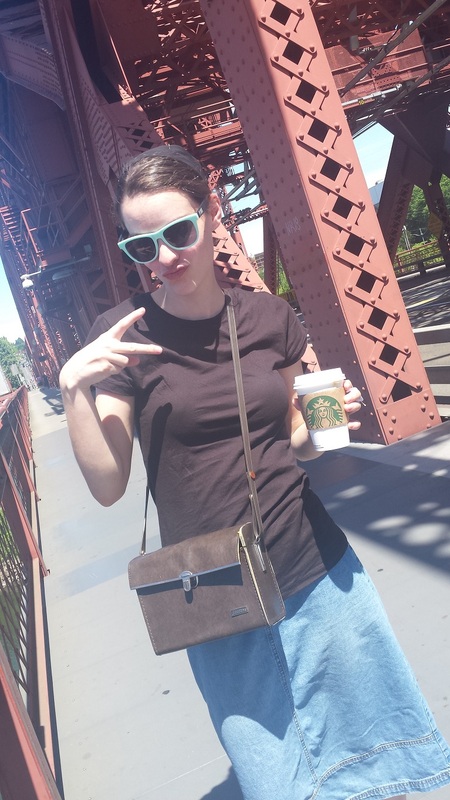 Then I got Sarah Beth to take a picture of me being a basic white girl. Obviously I fail at making duck lips. Do people even do duck lips anymore? I have no idea. We chatted with an older couple who informed us that there wasn’t much to do in this district except go to restaurants. Only, there were some good bakeries, they said. We skipped off in the direction of the bakery. Ashlie bought this odd fig bread that actually tasted really awesome. Then we wandered around, over a bridge and back again, before deciding to head back to the car and try a different section of town. This section housed the big thrift stores. One in particular was quite memorable. It was a Goodwill outlet where everything was thrown into big blue bins, and the stuff you bought was paid for by the pound. I loved that place. It was like a treasure hunt. You’d paw through stained worn-out t-shirts, and then, ta-da! You’d see a cute Chanel-type jacket. Unfortunately, too small. Keep digging. I could have spent hours in there, but grimy bins of twice-rejected junk is not everyone’s cup of tea. Next time I go I’ll have to take a crew of Yoders with me. Sarah Beth had a Sephora gift card, so we went downtown, parked in a parking garage, and walked past the swanky glass doors of the Apple Store, and Tiffany’s, and fancy stores like that. It was sort-of like a mini version of 5’th Avenue in New York City, only without the awesome window displays. Not being children’s book nerds themselves, Ashlie and Sarah Beth didn’t find it nearly as cool or interesting as I did. We went into Sephora, and Ashlie and I stood around playing with samples and marveling at how expensive the nail polish was while Sarah Beth shopped. Then we walked across the street to the mall, where we were joined by our friend Christina, who drove down from Washington to hang out with us. 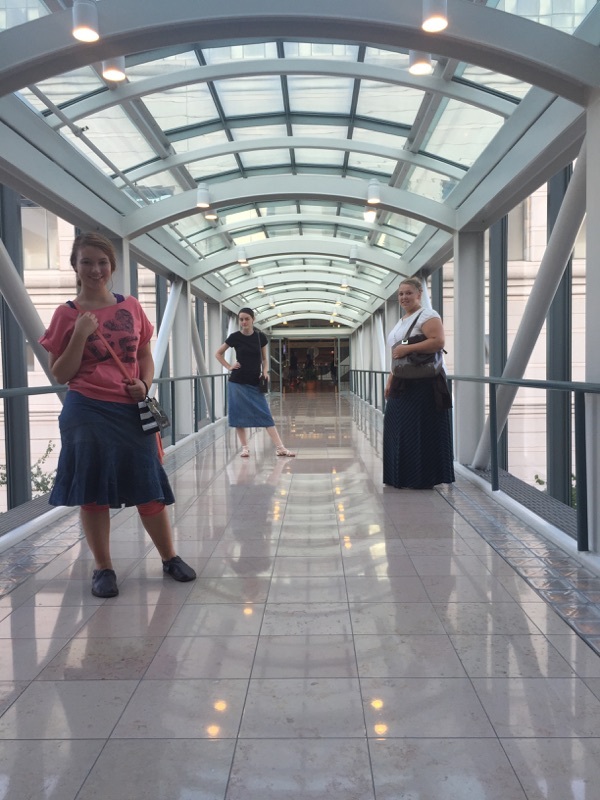 We stood in the skywalk and tried to look like cool people who hang out in skywalks. In general, we just hung around the mall until I got locked into H&M. “We should go have supper at those cool ethnic food carts we saw as we were driving over here,” I said, once I’d managed to exit H&M and joined my crew once more. So we nixed that idea and decided to just go home. Only we didn’t remember where we’d parked our car either. We went into the parking garage we THOUGHT we’d parked in, and after a lengthy conversation with the attendant, during which we realized that we were much more absentminded and spacey than we’d previously thought, the attendant realized that we were in the wrong garage. We needed to go to the one down the street, next to the athletic clothing store. Thus ended our Portland adventure, and we drove home, munching on fig bread to fill our tummies. It was was fun to nose around aimlessly, but I kept thinking about the time I went to Portland to hang out with my cousin Bird, who had lived there for a while, and she took me to a tea shop that sold countless types of tea, and the most artsy-fartsy thrift store I’ve ever been in. I’d like to visit Portland again, only plan ahead this time, and get advice from people who know their way around the city. Then I’ll write a Portland Expedition Part Two post. So if you, reader, have ever lived in/visited Portland, what were the niftiest places you liked to visit? There’s another Goodwill digs in Salem, but its not quite as much fun, because there aren’t any hipsters to watch while you shop. we just returned from OR, we are from PA. We visited the coast, and some lovely relatives from your area! The day we left we stopped at the Japanese garden in Portland before heading to the airport! Lovely. I do so enjoy the Goodwill by the pound stores, but you are correct that it takes a special kind of person to shop there as well as lots of time and patience. I like to watch the people who “stand behind the yellow lines” and wait to dive into the newest bin brought out. I second the rose gardens, and a restaurant from years ago that sold giant sandwiches, tortes, and doughnuts – can’t remember the name of it or if it even still exists. 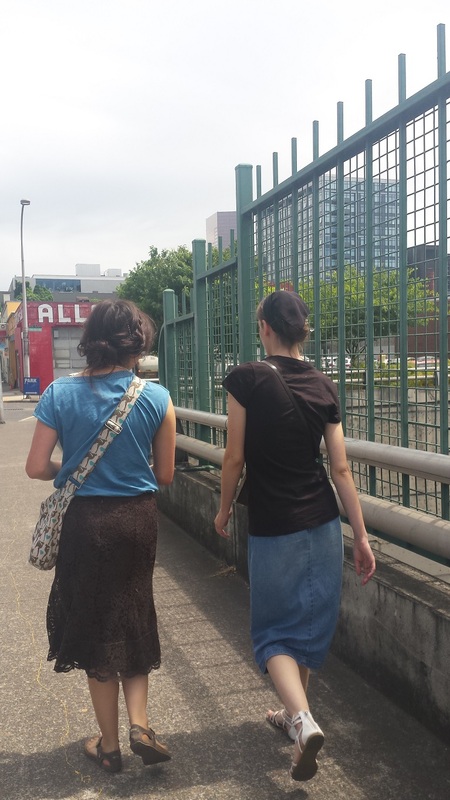 Last time I was in Portland – not counting airport visits – I made a point of going to northeast Portland to find Klickitat Street, and what I decided was Ramona’s house. It’s not far from Grant Park, which is home to the Beverly Cleary Sculpture Garden, and is an excellent site for a picnic. If you recognized those water fountains from TLG (because honestly, Emily, that’s really an obscure reference! ), how can you not love doing a Beverly Cleary tour?